Take a stand for Organic Farmers around the World! A threat to an organic farmer anywhere, is a threat to all organic farmers everywhere! This week, an important case is being heard halfway around the world in Western Australia about organic farmer Steve Marsh, whose organic field was contaminated by his neighbor’s genetically engineered canola. 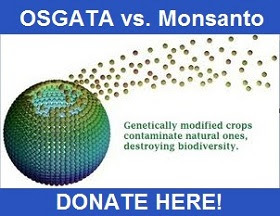 As a result, Steve lost his organic certification and as much as 70% of his Steve’s farm has been contaminated with Monsanto’s patented genes. With clever fine print in their seed contracts, Monsanto is not legally liable for their patented genes contaminating an organic farmer’s field due to their "no liability" agreement they force farmers who plant their GMO seeds to sign. As a result, Steve’s farm income and family’s livelihood has been put at risk. He could literally lose everything. 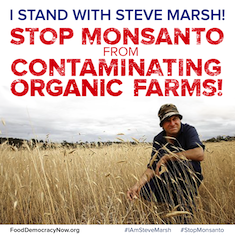 Please join us and stand with organic farmer Steve Marsh to protect the rights of organic farmers everywhere! Every voice counts!